This morning at 11 o'clock Sam Garris will be preaching his final sermon at the Ocracoke Assembly of God. Sam has served the church here for the past four and a half years, has volunteered with the Boy Scouts and Meals on Wheels, and has been a regular contributor to one of our local newspapers, the Ocracoker. After the service the congregation will hold a farewell pot luck dinner at the church to bid goodbye to Sam, his wife Anne, and their three children, Caleb, Jonah, and Luke. While I applaud Sam's service to our community, over the years I have often found myself in disagreement with his world view, and have written several letters to the editor expressing my opinions. One of the hallmarks of a vibrant democracy is the value we place upon freedom of speech. As Voltaire is reported to have said, "I may not agree with what you say, but I will defend to the death your right to say it" (Click here for more information about this quotation.). I wish Sam and his family good health, happiness, and contentment as they move on to another assignment. Walking along the beach a couple of days ago I noticed that the bones of a long ago wrecked ship were more exposed than I'd seen them in quite a while. Some years ago the National Park Service documented the known wreckage on Ocracoke Island, and if I remember correctly, were unable to identify any of the several vessels. The remains of this ship lie north of the Pony Pen, very near to where the steamboat "Home" met her doom in October of 1837. The Home was one of the most dramatic wrecks because it ran ashore far from the village before a Life Saving Station was established on the island...and because ninety people lost their lives when the ship broke apart. So, without any certain evidence, I nevertheless imagine that these timbers are the remnants of the Home. In any event, they are still a dramatic reminder of the perils of travels by sea along the North Carolina coast. I've just published another Ocracoke Newsletter (I apologize for missing last month!). This month I share the amazing story of native islander, Kelly O'Neal, and how he got caught up in the bloody 1951 revolution in Siam (Thailand). You can read the whole store by clicking here: http://www.villagecraftsmen.com/news012910.htm. Winter is, of course, the time of year when we islanders have more opportunities to spend time with family and friends. Days are short, and there's not much going on after dark -- not many concerts or wine tastings, or music on the docks. On Monday night I invited a few friends over for a simple supper of soup and bread. Luckily for all of us, everyone brought extra offerings. By the time we sat down at the table there was the curried apple soup (see "The Enchanted Broccoli Forest," page 25) homemade bread, artichoke dip, salad greens, red wine, homemade cookies, and a cranberry/apple/raisin dessert. To top it all off the after dinner conversation was enlightening, stimulating, and great fun. Tuesday I was invited to join three other friends' for another tasty dinner and more delightful conversation. And yesterday I had one more opportunity to spend an evening with still other long-time friends, with more delicious food. In the meanwhile I've been enjoying the curried apple soup for lunches. Ocracoke has a number of fine restaurants, and at least two are open this winter, but for those of us who live here the off-season can be a feast of culinary delights as we share meals with neighbors and friends. Clarinet, keyboard, bass, banjo, rhythm, and soul-filled vocals are coming to us right here on Ocracoke Island. Get your tickets now (only $15.00 per person) and put it on your calendar. 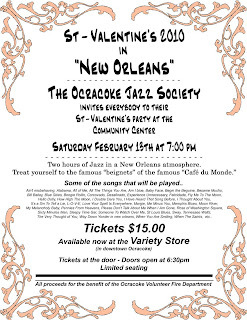 It's Saturday, February 13, beginning at 7 pm at the Community Center for "St. Valentine's 2010 in New Orleans" sponsored by the Ocracoke Jazz Society. Click on the photo below to see a larger image with more information. Every now and then as I walk along the beach I notice a "sand collar" near the high tide line. Sand collars are obviously the construction of some marine animal, and they are quite fascinating. As delicate as they look, they are sturdy enough to be picked up and handled. A sand collar will fit in the palm of your hand, and it feels almost as if it were made of thin plastic. But it's obviously constructed with beach sand. So what is a sand collar? It is a gelatinous mixture of sand and thousands of eggs, put together by the moon snail. It is a simple but elegant construction...one more wondrous treasure to be discovered on Ocracoke's beach. Several readers chastised me for not taking photos of the outdoor art exhibit several months ago. There is now a spontaneous art show located on the beach, just north of the lifeguard beach. Sometime around Christmas a dead tree washed up on the beach. It is now standing upright. I guess someone "planted" it. For weeks I've noticed that it is becoming more decorated with each passing day. The last time I checked it was festooned with seashells, seaweed, pine cones, plastic cards, mirrors, Christmas ornaments, a flip flop, one glove, red & green fabric, and pieces of driftwood. There's no telling how long it will last. Eventually, of course, it will succumb to the bureaucracy of the National Park Service (to their credit they've let it stand so far), or the incoming tide. But in the meanwhile it's become a curiosity and a way to celebrate our quirky creativity. 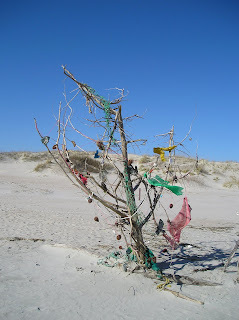 If you're walking by the beach tree, stop and add something fun! Earlier this week I published a photo by George Brown. George has been making photos in and around Ocracoke all winter. Several days ago George told me that, beginning today, he will be publishing a number of his island pictures on his daily photo blog, http://www.pixadilly.com/. Be sure to take a look at his blog every day to see new photos as they are published. Since before Christmas workers have been busy making long-overdue repairs to our beloved lighthouse. As a result, the light has been extinguished. At the present time plywood panels have replaced the trapezoidal glass windows in the lantern surrounding the fourth order Fresnel lens. Already the dome and spire have been completely restored and repainted. Reports indicate that the work is being conducted by a crew very familiar with the restoration of historic lighthouses, so we are delighted to know that our familiar beacon will soon be back in operation, and in a condition to weather the elements in good order for many years to come. A reader recently discovered an unusual "seashell" half buried in the sand on Ocracoke's beach. She left it with Deanna at the Ocracoke Preservation Society Museum, and I went down there to take a look at it. It was truly a beautiful specimen, complete, unbroken, and as delicate as fine China. I had never seen anything like it, nor had anyone else at the museum. They consulted various shell books but were unable to identify it. Back home, from somewhere in the deep recesses of my brain, the term "paper nautilus" popped into my head. I did a quick Google search. Sure enough, that's what it was. It looked just like the photos. But I didn't read enough to learn about it. And I wondered if this specimen had arrived on our beach from the Atlantic, or via one of the Outer Banks shell shops. A visitor could have purchased this exotic item and then dropped it accidentally while strolling along the beach. Later I went back to the computer and did a little research. I discovered that the paper nautilus is not a seashell at all. It is the paper-thin egg case secreted by the female Argonaut, a pelagic octopus that is found in tropical and sub-tropical waters worldwide. It may not be common for these egg cases to land on our beach, but it is surely possible for one to occasionally hitch a ride on the Gulf Stream and find its way to Ocracoke. To learn more about the Argonaut and the Paper Nautilus, click here: http://en.wikipedia.org/wiki/Paper_nautilus. A couple of days ago Capt. Rob of the Schooner Windfall loaned me a book from his extensive nautical collection...the 1878 classic by Nathaniel H. Bishop, "Voyage of the Paper Canoe." Bishop traveled 2500 miles, from Quebec to the Gulf of Mexico, in 1874-1875 in a 58 pound canoe (actually more of a kayak) made from the "newly available, lightweight, and versatile 'high tech' medium" (paper! ), which was treated with shellac. "This locality offers a place of retirement for men of small means and limited ambition. The broad bay is a good sailing and fishing ground, while the great marshes are the resort of many birds. The light, warm soil responds generously to little cultivation. After a day of hunting and fishing, the new-comer can smoke his pipe in peace, to the music of crackling flames in the wide old fireplace. Here he may be comfortable, and spend his last days quietly vegetating, with no criticisms on his deterioration, knowing that he is running to seed no faster than his neighbors." George Brown, who with his wife Reggie has been spending the winter on Ocracoke, is also a wonderfully creative photographer (you may remember that he shared some of his fog pictures with us back in December). He sent me an email yesterday with a photo of Saturday's surf, and gave me his permission to publish it here. You will see what I meant by "an angry, overwrought adversary." Sunday afternoon I took a later-than-usual walk on the beach. It had rained earlier in the day, and fog had rolled in. Overnight, it seemed, the ocean had morphed from a quiet and tranquil friend to an angry, overwrought adversary. I walked from the lifeguard beach and headed south into the wind. As I approached the airport ramp I noticed a small sedan stuck in the soft sand just a few feet onto the beach. It is always tourists who get stuck. They think they can drive in the sand with two-wheel-drive vehicles. I walked up to the car and offered to call Jesse's towing service for them But they didn't want to spend the money. They were two college age young men from South Carolina. Someone had already agreed to fetch them a tow rope. Then I guess they were planning to wait for a good Samaritan with a four-wheel-drive vehicle to pull them out. "If you let me drive," I offered, "and you two push, I think we can get her out. It's only a few feet back to the hard packed ramp." "But it's bottomed out," one of them said. Sure enough, the car was down on the chassis. But they hadn't spun their wheels, so they weren't mired up to the hubs. And the car was small and light. I scooped some sand away from the back of the front tires; the rear tires were sitting on top of the sand. They handed me the keys. I started her up and put her in reverse. Very gently I pressed down on the accelerator. With them pushing we moved about eight or ten feet, then came to a halt. After a little more scooping we tried again. Now we had Bert to help push also. In no time at all we were back on the firm ramp. "Thank you!" they both said as I handed them their keys and they settled into the car. "Oh, one more thing," I suggested as they were closing the doors. "I'd cover up that Phi Beta Kappa decal in your rear window!" The off season is also when we're more likely to find seashells and other gifts from the sea. Two days ago I looked down to see this starfish washed up in the high tide line. Sometimes, if the wind and tide work together, we'll find hundreds of starfish on the beach. This time there was only this one. Earlier this week I took a scud (for our off-island readers, that's a ride in a vehicle) out on the beach in my pickup truck. I seldom drive on the beach, but it's been so cold, and hardly anyone else is out there, so I drove up to the edge of the high tide line, stopped, and got out. Immediately I spied an unusual shell. To my surprise it was intact, and without blemish. It was a small helmet shell, and in perfect condition! Not far away I found a number of olive shells, one of which was also in pristine condition. I was reminded that helmets, olives, conchs and other seashells are constructed on the Fibonacci Sequence, or Golden Spiral. You can learn more by doing an Internet search for "Fibonacci Sequence". It is fascinating! Ocracoke Islanders, like other Americans, are shocked and brokenhearted by the devastation caused by the recent earthquake in Haiti. Ocracokers often have a special affinity with other island communities, especially ones vulnerable to storms and hurricanes. In recent years Haiti, one of the poorest nations in the western hemisphere, has had more than its share of hurricanes. Now this terrible earthquake is causing untold misery, injury, property loss, and death. There are many international aid agencies responding to the aftermath of this earthquake. The following link provides contact information for several of them: http://www.time.com/time/world/article/0,8599,1953454,00.html Donations of any amount are welcomed. On Monday afternoon I walked over the ramp at Lifeguard Beach and cast my eyes on one of the calmest oceans imaginable. There were only the gentlest and tiniest of waves lapping the shoreline, and no swells to break the wide expanse of the sea. It was, as islanders say, "slick cam" (slick calm). I was surprised to see one of our local fishermen skimming along the water's edge, just a few feet from shore, in his flat bottomed skiff, searching for rock fish. But where were the dolphins? Normally, in the winter, especially when the ocean is flat, dolphins are regularly in evidence. I scanned the water in vain as I walked a mile or so north. And then suddenly I spied a pod, ahead, and out a hundred yards. Before long more and more dolphins showed up. There were dozens, maybe hundreds, spread out in lines and groups, some coming so close to shore that I could have easily swum beside them. One turned on its back and flipped towards me. Another just lolled there, apparently enjoying a short rest. Still others splashed and raced. Were they playing or feeding or courting? I recently received the following Newsletter from our local Ocracoke Foundation, with exciting news about Pamlico Sound oysters and the upcoming oyster restoration project. The Ocracoke Foundation's (OFI) long awaited oyster restoration project is underway. Ocracoke is surrounded by oyster beds, many of which date to the mid 1800's. In the Gilded Age oysters were a big business and a major source of protein in restaurants and eateries in the days before refrigerated railroad cars made beef so popular. Surveys were commissioned, large companies created, and security enforced. The oyster wars were underway. The Pamlico Sound is rich with oysters. The NC Division of Marine Fisheries (NCDMF) and large private oyster operations undertake efforts to restore the oyster beds they access. Present day fisheries management guidelines guard against the disastrous effects of over-harvesting which led to depletion of the beds in the early 1900's by setting catch limits and rules on catch methods. Ocracoke oystermen oyster by hand only. They do not employ mechanical harvest methods. Ocracoke's oyster beds however are located in shallow water and any restoration effort calls for a shallow draft barge. Gene Ballance, an Ocracoke shellfish researcher and commercial fisherman came upon oyster surveys during a research visit to the NC State Archives. The Francis Winslow II maps were produced in 1888 and identify the oyster beds surrounding the island. OFI's oyster restoration project will be able to restore these historic beds by using their new shallow draft barge (shown above). Gene Ballance and fellow Ocracoke oystermen will also conduct research on the beds during restoration efforts. Funding was made possible by the Golden LEAF Foundation through a grant made in 2008 to help create an industry around one of Ocracoke's assets, commercial fishing. OFI is very fortunate to be receiving assistance from one of Winslow's ancestors Edward Sisson. With the family's blessing OFI will name the barge the Francis Winslow II. Mr. Sisson has provided us with a family history, research documentation and hopefully will be attending a barge christening in June with Winslow's granddaughter, Catherine Winslow Priest. One of Winslow's brothers, Arthur is a founding father of NC State University. Graduated MIT in 1881 in geology and mining engineering, came back to NC as a young man to open an engineering consulting office. Notably, Arthur led a committee of energetic science-minded young men that petitioned the state govt. to found an agricultural and technical college. That institution, after several name-changes and combinations with other colleges, is NC State. A dedication of Winslow Hall is expected in early 2010. 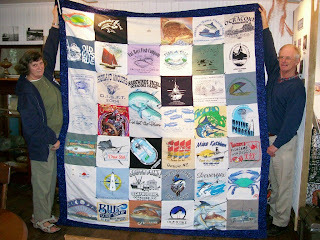 Some of our readers have asked to see photos of Joyce Reynolds' latest quilt that honors Ocracoke's watermen. I saw her in the post office the other day (by the way, that's where about 75% of Ocracoke's local networking takes place), and she agreed to send me some pictures. The first photo shows Joyce on the left, and Gene Ballance on the right. 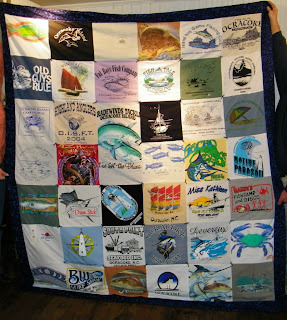 The quilt is put together from fishing related t-shirts, most of them signed by the local fishermen. Joyce said it was so much fun to collect the shirts, then to wander about the island contacting the fishermen for signatures. Joyce's quilt is being raffled off. Tickets are $15.00 each, and you can download a form to join the raffle by going to the OWWA web site (http://www.ocracokewatermen.org/). From there click on the link to "What's New at the Fish House." Good luck! 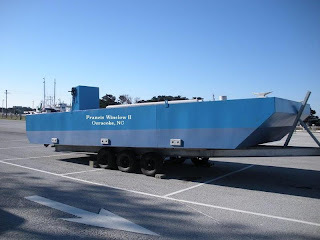 For more information about the Ocracoke Working Watermen's Association, click here. I was recently alerted to a story about a 13 year old Boy Scout, Ryan Krank, who was vacationing on the island last May. Out on the beach he and his father noticed three women who were caught in a rip current. One of the women was in serious trouble, and Ryan went to the rescue. For his bravery he was recently honored with a Boy Scouts of America Heroism Award, only one of 3000 such awards given since they were established in 1923. Ryan, your courage, bravery, and selflessness are an inspiration to us all. Thank you! My good friend, Jim Fineman, from Manteo, alerted me to the link below that includes an article about the "Nights in Rodanthe" house (also known as "Serendipity"). There's a great aerial photo of the house as it sits surrounded by rushing tide water. The move will not draw as many spectators as the Hatteras Lighthouse move, but it definitely won't go unnoticed or unreported. The 2009 Christmas Bird Count on Portsmouth was on Wednesday, Dec. 30. The Ocracoke Count was Thursday, Dec. 31. Christmas Bird Counts began in 1900 as an opportunity for people to get out and identify and count birds during a 24-hour period. They take place throughout North America and, increasingly, in many other parts of the world during the last couple of weeks of the year and tens of thousands volunteers help out. The Ocracoke count was started by Peter Vankevich and Bob Russell back in 1981; and they added Portsmouth Island in 1988. Last year, 101 species were reported on Ocracoke. This year only 85 species were sighted, but it was dreary and overcast. The traditional chili/key lime pie tally-rally for both counts was held Thursday evening (6:30 PM) at Pete’s place called appropriately enough, the Myrtle Warbler, located in Widgeon Woods near the lighthouse. If you are interested in participating next year (either on Ocracoke, or elsewhere) Pete says that good observational skills are welcome but you don’t have to be an expert to participate as beginners will be placed with more experienced birders. Here is the contact information for our local Bird Count (I think Peter would put you on his mailing list if you are interested for next year): petevankevich at gmail dot com, or 252 928-2539 for further details. About ten years ago Frank and Al were sitting in the front yard of the Hemp Shop. Frank casually commented to Al, "A squirrel just ran up that oak tree." Al calmly stated that it couldn't be. "There are no squirrels on Ocracoke," he said. Moments later Al turned to Frank and said matter-of-factly, "The squirrel just ran down that oak!" Leonard sent me another photo, of one of our island squirrels down in Widgeon Woods. I think they're all over the village! Oh my...squirrels! For hundreds of years Ocracoke was without these cute but sometimes destructive critters. Then, several years ago a neighbor (I won't mention any names) released a pair. With all of the oak trees in the village they have thrived. It is not uncommon to see them scurrying from branch to branch along Howard Street. 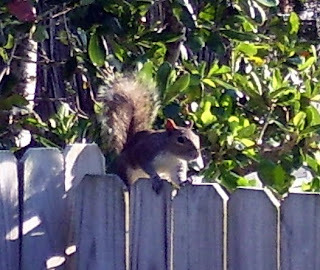 "One of your many blog followers recently asked if there are any squirrels on Ocracoke.Well, not counting the two-legged variety, there might be some. I frequently see them on Back Road, in the neighborhood of Rob and Sundae's house. "Then there is this cheeky fellow who apparently likes banjo music." Oh yes, salamanders -- none on the island that I know of. I'm pretty sure there aren't any. Maybe someone else knows for sure. Nor do we have possums, raccoons, or skunks. Deer are a very recent arrival, and minks were set loose here about twenty-five years ago. A bear occasionally swims over, but never stays long. And, we have nutria (also known as Russian Rats). While I was out of commission during the holidays I received a number of comments and questions on several posts. First, Lou Ann and I would like to thank all of our readers for your heartfelt thoughts and comments after the recent death of her father, for your Christmas and New Year wishes, and for your patience as I struggled with a head and chest cold that didn't want to retreat. Several readers sent words of thanks for this daily glimpse into island life. I'm so glad you enjoy keeping up with news about Ocracoke, especially during the off season. I like writing for you all! Friday Night Music at the Community Store -- I only heard that this was beginning again from a reader, but it is a wonderful way to spend an early Friday evening, sitting with friends and neighbors around the wood stove, listening to some terrific home made music. Amish Friendship Bread -- Sorry to say, during my long illness I forgot all about the starter, so the experiment is a bust. Nights in Rodanthe House -- I had heard that there was a contract on the house, and that it would be moved (some say to an inland lot, some say to another ocean front lot...I'm not sure), and that it will be remodeled inside to look like it did in the movie. Someone told me that the new owner was negotiating with the folks who moved the Cape Hatteras Lighthouse. I can't imagine a firm with much less experience tackling the job! Apparently the oyster roast was a big success. I missed it because I was too sick to venture out in the cold (and had lost my appetite). It seems it was so popular that they ran out of shrimp and fish stew early on. My advice for the next one: Go as early as possible. The Ocracoke Working Watermen Quilt by Joyce Reynolds -- I haven't seen it because I didn't get to the Oyster Roast. Maybe Joyce has a photo she can share. If so, I'll post it. The bison was purchased by our hosts in the Chapel Hill area. Don Wood in Brigetta's hot tub -- I'm not sure if I actually heard this story, or if I've just created my own personal mental image. But I'd love to hear it directly from someone who knows the story. You can write to me at piphoward at embarqmail dot com. Or, if you live on the island, stop me sometime and tell me the story! Bill Kostar -- I don't think anyone is taking a dip in the ocean this week! But congratulations on your adventurous spirit. I know of two people who several years ago swam in the ocean almost every day of the year...and I myself have been in the water at least one day of every month of the year. The secret -- when your eardrums start to ache get out. Sigma's friend David -- Thanks for your comment, and readership. Did you know that Will Willis' store is now the fishermen's exhibit for the Ocracoke Working Watermen's Association? Out on the dock, with smoke from a wood stove pouring out of the brick chimney, it's the perfect old-time Ocracoke venue for this project. Christmas Bird Count -- I missed these also (one on Portsmouth, one on Ocracoke), but I do have some information that I will share soon. Eventually I will write another monthly newsletter, but it may be a while. 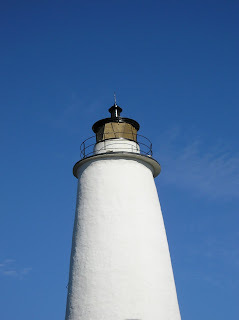 In the meanwhile you can read our November edition (Ocracoke Place Names) here: http://www.villagecraftsmen.com/news113009.htm. Well, I'm finally recovering! What an ordeal -- sinus infection, chest congestion, fever, coughing, inflamed throat. I'm still coughing after two different antibiotics and lots of bed rest...and trying to stay warm. Lou Ann came for a short visit. Luckily, on her last day I was improving, so we roasted a chicken and whipped up some yummy mashed potatoes for my first real meal in days. Then we sat in front of the fire and enjoyed the warmth and flickering flames. Lou Ann is back home in Indiana today. Last night I ran out of propane, but I still had heat. I've been lucky -- no frozen or broken pipes, but some neighbors have had problems. Right now it's right at 32 degrees, but it falls back into the 20s during the evening hours. I know it's much colder elsewhere, but right here in the ocean it feels so frigid. I saw Pat Garber, a neighbor who has lived many different places (in the west, in the mountains, in New England). She says she's never felt colder than right here on the island. Many thanks to all of our readers who have left encouraging notes on recent posts. Frankly, I have not had a chance to read them all (this is my first afternoon back at the computer), but I'll catch up in a day or two. Then if I discover any questions I'll do my best to answer. Wherever you may be I hope you are able to find a warm and cozy spot to insulate you from the winter chill. ...to all of our friends and readers! This will be just a short post. I have been sick (often in bed) for more than two weeks now, hoping the antibiotics will take care of the cough, sore throat, etc. I'm getting better (slowly), but still not up to par. I expect to be back with regular posts by the middle of next week.